Is baseball’s two-way player revolution upon us? 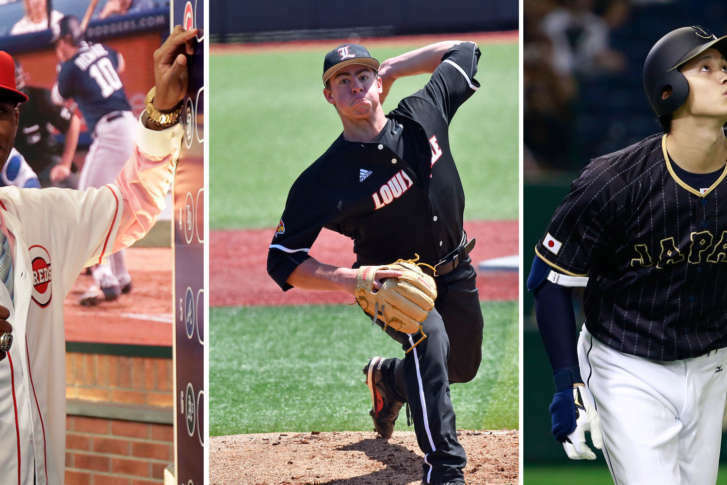 Hunter Greene, Brendan McKay and Shohei Ohtani may be poised to collectively shatter decades of baseball tradition. WASHINGTON — As anyone who grew up playing baseball knows, the best pitcher on a lot of Little League teams is also the best hitter. Maybe he’s also the shortstop or the catcher when he’s not on the mound. Great athletes are great athletes, and exceptional hand-eye coordination works wonders in all facets of baseball. Many players continue to pitch, hit and play another position in the field in high school and even major college programs. But once they sign on as professionals, players have traditionally been forced by their organizations to choose which path to pursue. It’s been decades since anyone has routinely done both at the major league level simultaneously, while a few, from Babe Ruth to Rick Ankiel, have found varying measures of success as one, then the other. So it is a matter of some coincidence and serendipity that three two-way players with big league caliber arms and bats — one from high school, one from college and one from abroad — could potentially burst onto the American professional baseball scene within a single year. Wunderkind Hunter Greene is just 17 years old, winner of a home run derby and owner of a 0.75 ERA his senior year of high school. One coach called Greene the best shortstop he’s ever worked with, from a list that includes major league players. Another, observing, called him a “big league shortstop.” Greene was taken with the second pick of the 2017 MLB Draft by the Cincinnati Reds. Brendan McKay, 21, just completed possibly the most successful two-way career in college baseball history. He finished his college pitching career at the University of Louisville 32-10 with a 2.23 ERA and 391 strikeouts in 315 innings. When he wasn’t on the mound, he split time at first base and designated hitter, slashing .341/.457/.659 with 18 home runs his junior year. McKay was selected fourth overall by the Tampa Bay Rays in June. Ohtani has been lighting Japan’s Nippon Professional Baseball on fire as a pitcher since he arrived as an 18-year-old. But it was last year, in his fourth professional season at age 21, still better than seven years younger than the average player in the league, that he exploded as a two-way threat. Ohtani went 10-4 with a 1.86 ERA and 174 strikeouts in just 140 innings on the mound, all while slashing .322/.416/.588 with 22 home runs in just 382 plate appearances as a DH. That earned him MVP honors of the Pacific League, an award won by Ichiro Suzuki (three times), Yu Darvish (twice), Hisashi Iwakuma and Masahiro Tanaka before coming to America. Lest you think his power bat and arm won’t translate to MLB, well, just watch. Baseball has become increasingly specialized, so there isn’t really incentive for pitchers who can hit. Colleges and high schools have instituted the DH. Minor league pitchers don’t hit until Double-A, and even then, only if they are a member of a National League affiliate playing another NL farm club. The last pitcher to play shortstop with any ounce of regularity in the big leagues was Johnny O’Brien, who did so for the 1957 Pittsburgh Pirates. O’Brien slashed just .250/.306/.320 over 250 games as a middle infielder while making 25 pitching appearances, just one of them a start, totaling a 5.61 ERA. He allowed more homers (nine) than he hit (four), never achieving much success on either side of the game. But this trio of young talent is cutting against the grain, forcing seemingly answered questions to be asked once again about whether two-way players can exist at the highest level of the game. “As an organization, when you draft these guys, really by letting them go both ways, in my opinion, you’re protecting your investment,” said Ankiel, who is now a life coach for the Washington Nationals, providing guidance to prospects. McKay actually signed with the Rays for just over $7 million, the largest number ever under the current draft system. It was surpassed two weeks later by Hunter Greene’s $7.2 million bonus from the Reds. So far, both organizations seem willing to let their young stars try to continue to succeed at both sides of the game. We won’t know whether the team that signs the 23-year-old Ohtani (for what will be a much higher sum) will try to maximize both of his talents. Among those who want to abolish the designated hitter, a chief argument is how exciting it is when pitchers are able to contribute offensively. Few results generate more excitement than a pitcher slugging a home run in support of his own cause. There were even whispers that San Francisco Giants pitcher Madison Bumgarner might serve as designated hitter during interleague games. Besides the sheer novelty of the whole idea, there is a huge practical advantage to having such a player on your team. As bullpens continue to grow and become more specialized, the number of position players on the roster continues to shrink. To have a starting pitcher that can also be your shortstop, or first baseman, or even designated hitter the rest of the week opens up your bench options. Ankiel was known as a promising young flamethrower who lost his control on the mound to the point where the psychological pressures of the game took over. He made the switch to outfield and forged a solid second career, where his arm strength helped him make highlight reel throws. He even swatted 25 home runs in 2008. But Ankiel thinks the hesitation among professional clubs in allowing two-way players is rooted more in the fear of injury than of failure. For college coaches, this concept is nothing new. To be successful, they need to find players who can both pitch and play a position, due to their scholarship limitations. Division I baseball gets just 11.7 scholarships for a 27-man roster, making players like McKay especially valuable for a coach like Dan McDonnell, who recruited him to Louisville. So valuable, in fact, that McDonnell found himself overthinking his usage of McKay, electing to only DH him his sophomore year, causing his numbers to drop. In addition to rotating McKay between first base and DH when he wasn’t pitching this year, McDonnell had a team manager stand in foul territory next to first base during practice to serve as McKay’s designated thrower, saving him the extra wear and tear that a few hundred routine tosses do to the arm. The major league clubs in charge of these players will have to similarly look for ways to manage fatigue, taking cues from the lower levels, with no established professional road map to work from. Baseball, institutionally, is a sport that cares so very much about what everybody thinks of every decision. It’s why managers still bunt in situations where such actions have been mathematically proven to reduce run scoring efficiency. It’s why, still, we list batting average first, as a key statistic for determining a player’s offensive worth, rather than just as a subset of on-base percentage. It’s why progress often happens glacially, why teams ahead of the game on defensive shifts or high leverage bullpen usage have been able to squeeze wins out of the margins of the sport. It’s one of the reasons we don’t have two-way players. Not yet. “Just because they’ve always done it this way, that don’t mean it’s right,” McDonnell said. McDonnell knows a little something about winning. His Cardinals have won more games than any team in college baseball over the past five years. He’s both a fan and friend of Chicago Cubs manager Joe Maddon, who has been at the forefront of unconventional strategic moves, whether it be using players like Ben Zobrist to play a handful of different positions in the field or moving a pitcher like Travis Wood to the outfield for a few batters so he can be used again later in an inning. When he was in Omaha at the College World Series this year, McDonnell was tinkering with the idea of lineup moves, and he reached out to Maddon for his thoughts. The response? It’s going to take that same open-mindedness to get Greene, McKay and Ohtani to the big leagues as two-way talents. Any one of them arriving on the scene alone would be fighting an uphill battle against history, the “not since Babe Ruth” disclaimers following them at every turn, every failure on one side of the game used as a talking point to limit focus to the other. But if all three of them start their two-way professional paths to the big leagues at roughly the same time, perhaps they can help carry and propel one another. Baseball’s a game as rooted in and based on numbers as any. Could the sheer number of two-way players themselves converging on the doorstep of the majors play a factor in a collective shift of consciousness? Both Ankiel and McDonnell have the same answer: Absolutely. “Everybody can kind of feed off each other and what seems to work and what doesn’t,” Ankiel said. “These three guys, doing it together, at a similar time, could change the culture over the next 15-20 years,” McDonnell added. He compares it to Magic Johnson’s breakthrough as a point guard at his size, Doug Williams and Warren Moon breaking down the door for other African-American quarterbacks or Roger Bannister breaking the four-minute mile. Each player’s situation is different and each organization may end up evaluating the merits of how to maximize their player’s value in different ways. We haven’t seen talent quite like Green, McKay and Ohtani in a long time, if ever. But if they break through as two-way players at the big league level, we may see many more like them in the generations to come.